Attention: All of you families who may have abandoned life-long friends and stopped going to traditional age-segregated churches, proclaiming them anti-Biblical because of the teachings by Doug Phillips and Vision Forum . . . . . . . your ringleader has abandoned you. But wait . . . .what happened to the family-integraged church mantra, Doug? 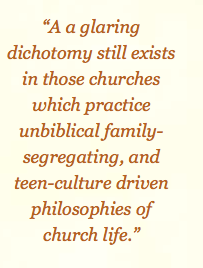 Those who have followed Doug Phillips’ teachings for any length of time will certainly remember this important part of his core teachings: family-integrated churches. Phillips was strongly opposed to age-segregated churches, Sunday schools, youth groups, etc, the “biblical” way was to have the family remain together at church. Many new family-integrated churches popped up all over the States because of his teachings. In the beginning of August, I was sent information easily verified on the internet that four members of the Phillips family have indeed become members of a new church. Doug Phillips, his wife, Beall, and two sons, were listed on a church posting online. I’m unclear why his older daughters have not become members. Do they do not have voices to become members? Now, my church probably has around 400 attendees on an average Sunday and there’s no way our church could provide the same variety of groups and have them fully staffed. That should give you an idea of the size of the church the Phillips family is now attending. I’m not sure what numbers define a mega church, but I suspect Doug Phillips’ new church would be identified as a mega church. It is obvious that the normative practice for Israel and the early church was to integrate children into the normal practices of the gatherings of the people. Nowhere do we find a trace of teaching or example of our modern age-graded approach to the church. Did you catch the word unbiblical? Yea, so evidently, the Doug Phillips family is being unbiblical as they attend their new age-segregated church, that is, unless he has changed his core beliefs. But if he had a change of heart and truly believed he was wrong in his former teaching, wouldn’t he retract his old teachings? Wouldn’t he be repenting of his erroneous teachings? Maybe not. What we’ve seen of his public statement(s) of repentance has been lacking. But wait, there’s more: not only does this new church offer age-segregated church activities and groups, it also offers a :::::gasp::::: a school. A school would certainly go against the teachings from Phillips/Vision Forum that only parents should train their children in the way in which they go. So how could he attend such a “heathen” church? Has he lost his mind? . . . or has he finally come to his senses? The hypocrisy in all of this is astounding. I hope that homeschool parents who read this really challenge themselves to test his old teachings. Has this man gone astray by bringing his family with him to attend this more contemporary church? Or was his original teaching baseless and extra-biblical? It’s very important to understand how many people changed their lives, from how they raised their children, to where they went to church, because of Doug Phillips. Some families were so swayed by his “biblical” ideologies they quit jobs, sold homes, left family and friends to be closer to San Antonio and the Vision Forum empire. They wanted to parent their family biblically. I have actually spoken with someone who made the move and have heard of many more. And now Doug Phillips is kissing all of that “biblical” teaching good-bye with nary a word to his followers? That is so wrong. I’ve heard from scores of people who have been harmed by his errant extra-biblical teachings. My heart goes out to them as they try to put pieces back together and hold their family together. I find it ironic that in the attempt to keep families together, the very opposite has happened for many families. Moving along to other related matters, with the recent statement from Michael Farris of Homeschool Legal Defense Association (HSLDA) in which he discussed the ideologies perpetuated by Doug Phillips and Bill Gothard that have caused harm to families, a surprise commenter appeared on the HSLDA’s Facebook page. The comment came from Doug Phillips’ wife, Beall Phillips. I am sorry to say that what has been taught on the pages of Vision Forum is very different than what you are now saying. VF posted an article by Jennie Chancey where it is made very clear that women ought not to vote. This author has also declared that women working outside the home is “blasphemy” also on VF and in the book she co-authored with Stacy McDonald (also published by VF) made it clear that women only have one acceptable role, that of being wives and mothers. VF has also made it very clear through the years that daughters are to remain home under their father’s authority until they are given in marriage and are not to work outside the home. Did you not watch The Return of the Daughters film? It’s interesting that some leaders will express certain ideologies for their own congregants, while living a completely different lifestyle. We have a word for that: hypocrisy. Perhaps that is the case here. I’m so sorry you are having to go through this, Beall. There certainly is confusion in the Homeschool Movement camp. Stay tuned, I’m working on a new development with Doug Phillips/Vision Forum and hope to get the post up sometime today. One thing Phillips seems to have finally gotten right is that you don’t need a church’s permission to leave. If a church is healthy and strong and I leave for the wrong reasons, that’s on me. If it’s unhealthy and weakens its members and I leave for the right reasons, that’s on them. But either way nothing in the Bible says I need their permission to leave. Too bad Phillips didn’t tell everyone that long ago, but perhaps those who follow his abhorrent teachings will note his example on this one. Exactly, Tim. I don’t have a problem with him leaving his old church, nor do I have a problem with him going to an age-segregated church, but it is the hypocrisy that is disturbing. He forced people to follow the rules he established. He guilted them that if they weren’t going to family-integrated churches, they were doing it unbiblically. I wonder how many people changed their ways due to him. I wonder how many people were harmed with his teachings? Actually, sometimes I’d rather bury my head in the sand rather than think about it because I know the price and the pain. It is so disturbing to me. his rules were fine by him as long as he was using them to keep other people in line. As soon as it was him, he chose no to follow those pesky rules. After all, rules are for peasants, right? Yup, Tim, same thing cult leaders do. P.S. Thanks for linking to that interview I did with Doug Bursch yesterday. It was a last minute thing. Doug’s a good interviewer and made me sound a lot more intelligent that I expected to sound. Doug is a great interviewer. He interviewed me a while back on spiritual abuse and his tender heart for victims of spiritual abuse was evident. I think it’s one of the best interviews I’ve done – not because I was on it, but because the sensitivity that he has towards those who have been hurt. And it was especially meaningful to me because he is also a pastor who cares. I tried that link to your interview with Doug but it came up as a 404 error. Oh wow, thanks for letting me know. I wonder if they only have it posted for a time. I’ll ask Doug. I have the privilege of worshiping in a small, family-integrated church. When asked about our various church programs, I explain that we are blessed with more than thirty different organizations to which our members belong — they are called families. I further explain that we have more than sixty youth directors — they are called parents. In fact, we have such a full schedule of events that there is a mandatory activity every day of the week — it is called family worship. When the household is functioning according to these God-directed purposes, it becomes the most powerful instrument available for the Church of Jesus Christ, next to the Bible itself, in its arsenal of culture-transforming, kingdom-building tools. When properly understood, the doctrine of the Christian household is the antidote to the palsied, family- fragmenting efforts of modern churches to resist the world through man-centered programs which do little more than bring the philosophies and methodologies of the world into the Church of Jesus Christ. No wonder my kids have a disdain for “Christians” in the homeschooling world. It is a public disgrace to Christ. The “church youth program” used to link to a photo of the Phillips family in the Brown home (or barn) with some Brown kids, an intern, and — wait for it– the other woman! Phillips is, and always has been, of course, above all, an ACTOR playing a role. He’s now free from the FIC role and has moved on. Of course, play actor = hypocrite. I’m only being facetious with the “other woman” description– really his victim. I think Beall is taking her anger out on the wrong man. Not only did Doug influence homeschooling and FICs, but he profited financially from his teachings. I understand a mother and wife wanting to defend her family, but how can she enjoy the benefits of being an influential leader’s wife, then play victim when her husband’s hypocrisy is uncovered? Beall’s children will have a hard time learning personal accountability and responsibility with parents who act so entitled! JA, great article! Any idea when Doug goes to court? I don’t have an answer to that, ChelleBelle. I should try to get an update. And whether he is actually up on criminal charges or just civilly liable. The Doug and Vision Forum Miseries are named in civil litigation. No criminal charges have been filed as of yet and probably won’t be. When someone waits so long to complain about a perv ejaculating on them without their consent it makes a successful criminal prosecution all but impossible. Next time the victim needs to take up the role of Lorena Bobbitt or Mary Winkler and see how well Little Lord Fauntleroy ( emphasis on little as in Evil Midget of San Antonia) likes that role. 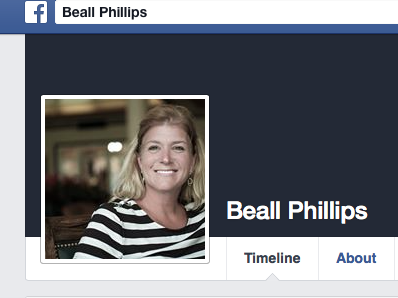 Is it just my imagination, or has Beall lost a lot of weight and colored her hair? Ok, I got a response I was waiting for and will be posting more on this case tomorrow. From the facebook page comments on HSLDA – what do we say to folks like this who blame the victims/hearers of the false teaching? I think here you sum it up well… it is in the misunderstanding and wrong application that a lot of the hurt has come from. When people try to make formula’s out of man’s opinions. I would say the majority of my friends that have been hurt have had that as the problem, misapplication/understanding of what was being taught and a lack of love and God’s grace in the family. What would prevent people doing the same thing with what they learn from HSLDA? People could be hurt by the home school teachings from HSLDA just as much, if they twist what they hear/read. I’m thankful my parents had my siblings and me glean from many men who have taught us so much over the years while also teaching us to have the Bible be the final authority… which may mean at times you “eat the watermelon and spit out the seeds” of man’s teaching. We need to be responsible to take all teachings we hear, and see how they line up with scripture for our final standard and remember that we’re all sinners saved by grace in different places along the road of sanctification. I know it’s so frustrating, but there’s been plenty of research done by concerned homeschoolers for years about this movement that is available if they would just check it out. Yes, they can spit out the seeds, but that would mean that they are able to make those distinctions. This is hard to do when lots these teachings are taught as universal standards. I’m glad you had parents that gave you the tools to use, but it sounds like there are many who don’t have that ability and swallow the whole thing. I also think that it will be awhile till Beall sees the full implications of both her marriage and her husbands’ teachings. It is one )thing to “stand by your man” but quite another to publicly defend hypocrisy as then she is also responsible for it. It would be better for her to just stay quiet, like a nice little submissive wife…..her children will pay the price for the problems inherent in their thinking. So true, annie. The Phillips kids are the ones I am most concerned about. The parents will have to deal with the drama they created, but the kids had no choice in their upbringing. Hopefully they will have an opportunity to test the culture in which they were raised. I’m glad they are now at a traditional church and hope they will get to mingle with others outside their homeschool circles. Perhaps this scandal and Phillips’ escaping BCA and moving to the mega church will be the Phillips’ children’s best hope for normalcy. I caught Doug teaching women’s suffrage was bad too, while doing the Big Box series. As you’ve shown, it really is painfully easy to document that he (and others) taught this. Some anti-patriocentric bloggers are taking issue with Farris’ characterization of certain patriarchal teachings in that white paper, but not with this one, because it’s not a caricature at all. …women are as intelligent as men. Women are as capable as men. Every bit. That’s not the issue. What happened when we adopted the nineteenth amendment was we stopped being a nation of families and we became a nation of individuals. Prior to that, the family was represented in the gates of the land by the head of the home. Now the wife cancels the husband, the husband cancels the wife. And you see, this is what feminism has done to you. Instead of thinking as a family unit, thinking as one, where the two become one and they colabor together, you think of yourself as I’m the wife, and he’s the husband, and I’ve got my deal and he’s got his deal, and the twain shall never come together. This is the egalitarian spirit of feminism. Per Beall voting, the only attempt at an explanation I’ve seen is that it was pragmatic – i.e., women’s suffrage is bad, but nowadays conservative women have to vote because liberal women are voting too. Since Doug would have been the first to denounce pragmatism (and I’ve heard him do that too), it’s hard for me to see this as anything but a double standard and/or a privilege afforded to the guru’s wife and daughters but not to the rest of us. Personally, I was a bit shocked when I read that in Beall’s comment (though maybe I shouldn’t have been? ), and then it made me a little mad. Not because she was voting (which she has every right to do), but because her husband was teaching everyone else not to, while apparently not stopping her. Hester, this is the way it worked for the Phillips. What he preached was not necessarily what he practiced at his own home. It seems his wife enjoyed her life. They were living in a 7,000 SF home. On how big a tract of land? Now that VF’s insurance carrier is bailing (“YOU’RE ON YOUR OWN!”), that’s a LOT of a$$et$ that can be seized to pay the judgment. Hope Douggie ESQUIRE is better at hiding assets than Imelda Marcos or O.J.Simpson (both suddenly poor as a church mouse once the court came in against them). The hypocrisy and double standards are pretty disgusting. In other words, it’s fine and dandy to cancel out the votes of liberal women, but not husbands. Unless your husband votes liberal, God forbid. I remember when it came out that when Matt Chancey ran for local political office, his wife Jen went to the polls and voted for him. She was asked on the Ladies Against Feminism blog if she had changed her mind on women voting. Granting that this was years ago, to the best of my knowledge she never answered the question. When this all broke with Doug, I got to know someone who was at one time very close to Doug – very. He said that how Doug lived, dressed, etc. was very different (more casual/liberal) than the movement itself that sprung forth. His take was that people took some of the teachings and ran with them – extrapolating out things that Doug never intended. Whether that’s true or not, I have no idea – but – I can kind of see it in the same way that many women are actually the ones pushing their husbands into the movement (ironically). That makes sense, because it’s the moms checking out curriculum, generally speaking, and they find what is appealing to them… Maybe these things got even crazier when people were not only following Doug, but adding to the mix, Gothard, Swanson, etc. They’re like the Trio of Spiritual Death. You guys are focusing in on where they are going to church and their hypocrisy. I can see why……..but one thing you guys aren’t seeing, is that I can’t see Doug sitting back and being quiet for very long. He will be there…….be semi quiet, calm and kind of melt into the congregation. He’s a VERY VERY manipulative man, He knows very well how to get what HE wants. An unsuspecting, passive pastor without much knowledge of Doug or discernment of his intentions, would eventually be devoured. When you are in a large mega church, it can allow for people like Doug to “rise through the ranks” and literally cause division and split a church. And the Theology Doug taught known as :Christian Reconstructionism. Why has their not been any voices about the many years of Doctrine taught by Doug and his ministry. ( that we *now are living in God’s Millinum reign on Earth ) known as reconstructionism. His deception in this is evil! All the generation brought up under this teaching (- known as reconstruction theology) ~~~that doug always taught – went under the radar) Doug never showed his hand…. As we desperately desired to serve God as Parents- training our Children to Godliness – we fell into a deceitful political Campaign Web. Doug conditioned a whole generation of young people- thinking that they are * now living in the millinuim reign of God- and they are brain washed to believe that ( patriots must DIE ) for America if they are REAL Christians. ( for such a time as this~~~ our sons and daughters, will be Fodder for Their Cannons!!!) as Doug and those teachers with him- act as ” The Generals” that they idolize- and taught our children to idolize! ( Doug Philips ) and those mens teachings he endorsed- political propaganda ! ( Rushdoonys) teachings on law and theology- known as reconstructionism. This generation was taught to – fight the 2 revolution war .. Under the radar— so to speak!! Yes the whole generation!! These Generals who fought and their submissive wives by their sides! Vision forum taught a wicked, perverted , doctrine- that has gone basically undetected. This allegence was taught- and remains imbedded in the generation – he groomed! Deception runs deep in many levels. Doug was carrying out his fathers agenda. Yes- we are angry and hurt and disappointed deeply! After law schools and teachings- this is what was actually going on! Betrayed! We were so blind! See below the Political Campaign of Doug Phillips and that was also His Fathers! It’s all actually about government agenda. Christian Reconstructionism is a fundamentalist Calvinisttheonomicmovement, founded by Rousas John Rushdoony, that has had an important influence on the Christian Right in the United States. Reconstructionists advocate theocracy and the restoration of Mosaic law, such as the Biblical admonition to stone homosexuals to death; thus, Reconstructionists are generally characterized as political radicals. The movement declined in the 1990s and was declared dead in a 2008 Church History journal article,although Christian Reconstructionist organizations such as the Chalcedon Foundation and American Vision are active today. Christian Reconstructionists are usually postmillennialists and followers of the presuppositional apologetics of Cornelius Van Til. I think we all should be careful not to demonize absolutely everything Doug Phillips taught. For example, the fact that people used to vote as families in early America is true, and if everyone did that, we’d be fine. The fact is that now women can vote, and we should. But it’s still true that it just doubles the amount of votes, and that if the marriage isn’t together, the spouses just cancel out each other’s votes. There isn’t anything wrong with saying that. The problem was that he was hypocritical, not that every single thing he taught was wrong. He should have just admitted that he didn’t follow this teaching, and maybe he did admit it, I don’t know. What I’m seeing in all of these comments is that people from hundreds of years back, like John Calvin, are being dragged into this debate, along with every other person who hints at patriarchy. There is a problem with doing that! You could have a following just as easily as Doug Phillips, with hordes of people throwing out all of the teachings ever taught by the religious right, and turning to whatever they feel is the opposite. If Christians are that gullible, and may be hurt by false teachings, then where are they supposed to turn now? Should they all become left leaning liberals? Because I can show you lots of problems with liberal beliefs too. It’s so true what the above commenter said, that we are supposed to imitate Christ, who tells us to love one another. Let’s weigh what we hear and not blindly follow every wind of doctrine. And let’s stop blaming Doug Phillips for our own mistakes in judgement. I was happy to listen to him too, at one time, and it wasn’t until a dear homeschooling friend told me Love is the real law, not rules, that I was able to stop following blindly. I stopped wearing skirts all the time! Little by little, I learned to tell the truth in many areas of my life. God is still showing me daily, more areas that I have to turn over to His loving control. That’s really hard to do when you live so much by ideologies and not by love. I actually believed my ideologies would make me acceptable to God. I felt like judging everyone who didn’t do whatever I did. I really hadn’t experienced grace at all. No wonder I loved patriarch teaching. It seemed to say that I was absolved of my responsibility. I was happy to blame my husband for everything, and I often left him struggling in his sins without sharing the truth with him so he could be free. I don’t know if it’s the patriarchy movement that teaches this, or if I was just reading it all into that. Legalists will look for arguments anywhere. In all of this turmoil, God will only be glorified if Christian brothers and sisters deal with each other and with themselves in truth and love. One question I have is, what is wrong with family integrated church? I read your post and immediately thought of all the warnings about false teachers who devour Jesus’ sheep (Jesus being the One Shepherd/Pastor) from His Church which He is building. Depends on how you define the church. If you’re talking about religious social clubs called Churches then I guess that system of religion is no better or worse than the alternative. i do favour the ‘church that is in thy house’ concept. And desperately wish we harness that simple kind of ‘assembling together’, without facilitation required by a learned man who more often than not isn’t overly hospitable (one of the qualifications, so I’m told). Thankfully never got subjected to any of those teachings. Heard some of Voddie’s. Works well… If you have a family to begin with.